Major Events from our Timeline. Current Events that are History Based. View History related events on EnchantedMountains.com. Learn by doing! Join in an Amish Folk Art Class, with history of American and Amish quilting. Presented by the Leon Historical Society and Museum, you can make a traditional pattern quilt block with Amish and English instructors. In May's class, you will learn how to make a Trapunto Pillow, choosing from various designs. Ischua Valley Historical Society will host a Victorian Tea on Sunday May 20th from 2:00 PM to 4:00 PM at the Miner’s Cabin on 9 Pine Street in Franklinville, New York. The cost is $20 and since seating is limited, reservations and payment are due by May 10th. Please call (716) 353-2355 for reservations. Dive into the many museums scattered throughout Cattaraugus County on June 15th, 2019 – “Cattaraugus County Museum Day” to uncover exhibits that display our towns and villages Historic paths through time. Learn local history and the ongoing stories of your community, the landscapes surrounding you, and the United States as a whole. 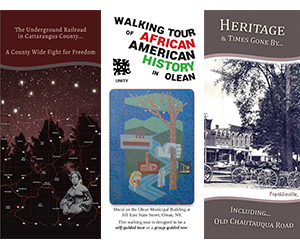 Feel the connection as you find your own Historic Path on Cattaraugus County Museum Day, part of the NYS Path Through History Weekend. The Ischua Valley Historical Society is offering a Unique Field Trip! The Summer at the Stone House event series continues on July 25th! David Ruch, musician and performer, will be presenting on the Music of Buffalo's Waterfront. He is known for using music to teach core curriculum and inspire young leaners.